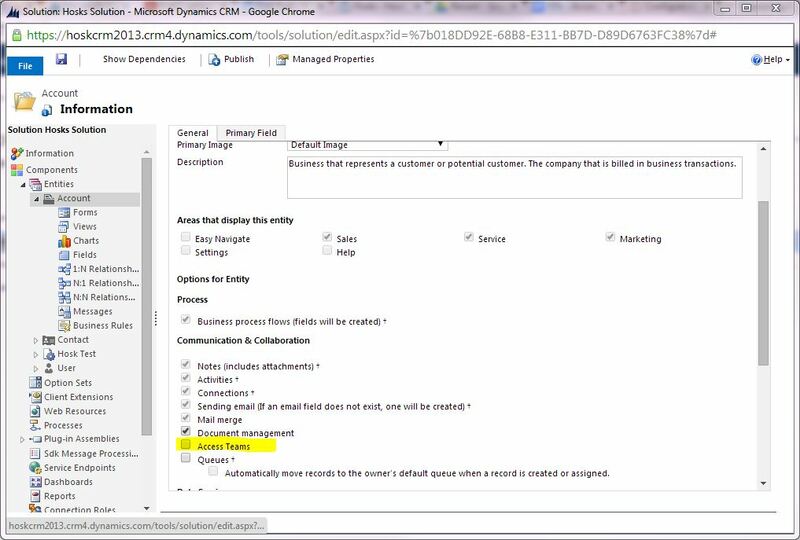 A new feature in CRM 2013 is Access Teams. 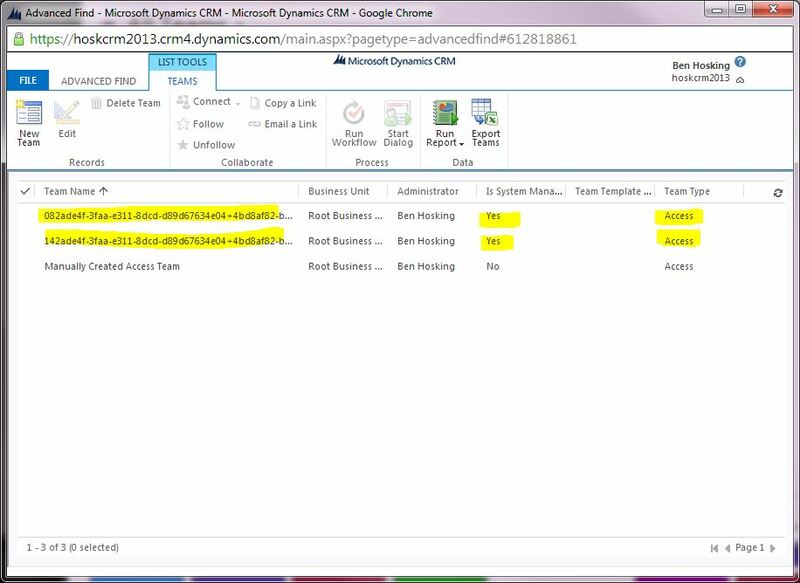 For those people studying for the MB2-703 – CRM 2013 customization and configuration exam, you will need to know the difference between access teams and Owner teams. I personally have not understood the real benefit of Access teams and access team templates, I understood it was an quick way to share individual records but I wasn’t sure how this was different to the current sharing functionality. The standard owner team/user functionality allows you to share records and components (views, dashboards) to users or owner teams. Access Teams and Access team templates are a method to share permissions and records, which is easier to manage, quicker to add/remove users/teams because Access team templates will applying a standard set of privileges (read, write, delete, append, append to) rather than having to set this up for each individual user/team. An overhead of Owner Teams and sharing is they write records to the POA (Principal Object Access) table and this may eventually can result in performance overhead. It should be noted that sharing records with teams is a lot more efficient than sharing records with individual users because it only writes less records to the POA table (for the team) rather than each individual user. 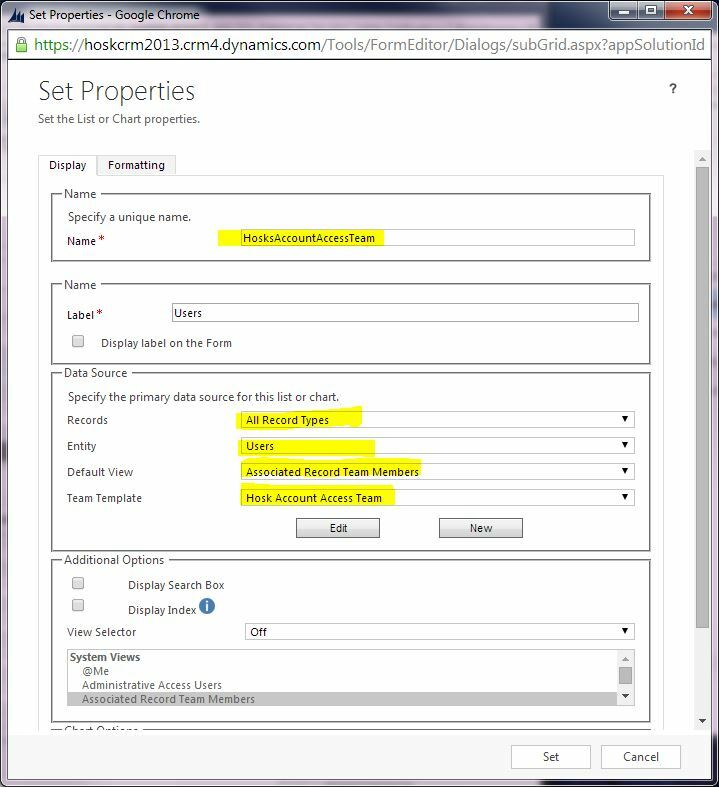 Access Team templates are enabled on an entity basis and you have to enable Access Teams on the entity in the communications and collaboration as you can see below on the screen shot. Once you have ticked the access teams check box, save and publish (I don’t think you have to publish but just to make sure). Now the next step is not straight forward, when I say that I don’t mean it’s difficult but I do mean most people would never guess what to do next. Team Template – Hosk Account Access Team – this is the team template I created in the step before, yours is probably called something different. Odd things happen when you add a user to the user grid it will automatically create an Access Team but the odd things is you can’t view this team in the Teams section in Administration even if you select All Teams or Access Teams. The only way to view the teams is to create an advanced find, search for Teams and choose of type Access. if you click on one you can then view the details. 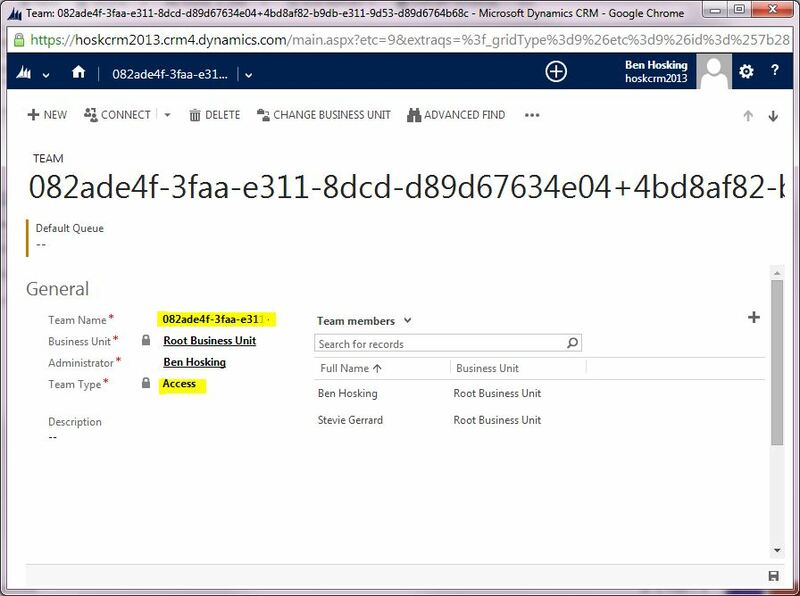 So you will get a new team for each entity and access template type. You can also add and remove members in this screen. If you remove all members the team will disappear until you add another user to it. The final import thing about access team is they do not write to the POA (Principal Object Access table). This table holds all the rules about sharing for users/teams for each entity. The POV table holds information about sharing and security/access and is read every time a user accesses a record to make sure they have privileges to view and then update/delete it. A big POA table with lots of sharing of records can in some cases slow down the system. 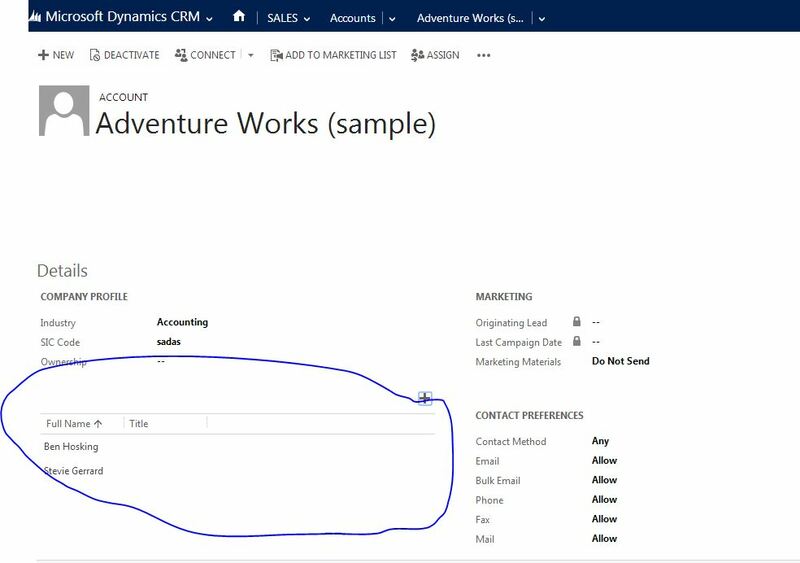 After reading CRM MVP Adam Vero’s comments it seems access teams do write to the POA table so this isn’t where the advantage of Access teams comes from. On the efficiency side Teams do write fewer records to the POA table than sharing to individual users. Owner teams are good when you want to share records to teams and those teams should have their privileges set by security roles. access teams are good for quick ad hoc sharing of records where the users who will need to use a record may change often. 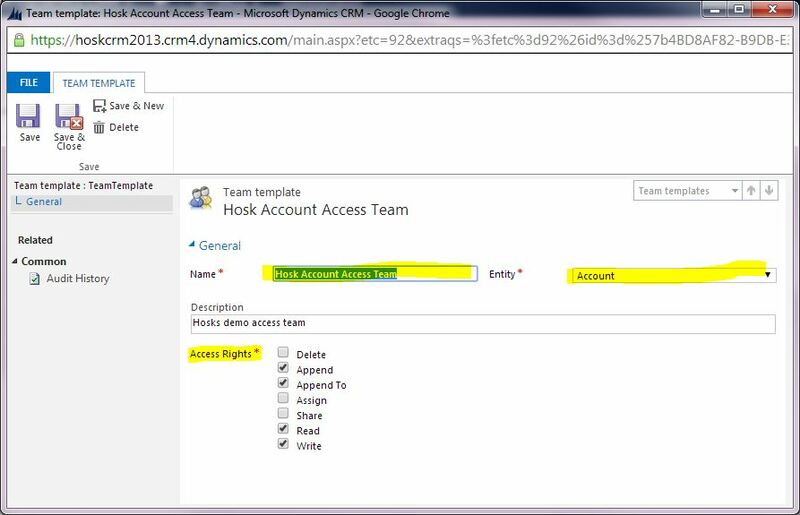 Access teams allow you to quickly add and remove users. The first bit is true, and is always a useful reminder of security 101. But “create” is not a privilege you can share – shares apply to records, which by definition are already created. Substitute a different privilege in your example, such as delete. Also note that to add someone to an Access Team, you must have the rights to share the record. You might already have these rights through your security roles (perhaps a manager can share any record in their Business Unit), or, as you mention, because they have been granted sharing permissions when they were added to the team themselves. This model, which is mentioned in the course, I think of as a “collaborative” one – anyone in the team can invite people in, but you cannot necessarily add yourself and just “opt in” to deal with a record. To be clear, there is one Access Team per record per template that has users added. So if I have two templates for the Opportunity entity (maybe giving read, and read-write privileges), then there could be zero, one or two teams for every record. Each Access Team name is a *concatenation* of the GUID of the template and the related record, just to keep them unique. In the video you mention a couple of times that it seems weird that Access Teams are not shown in the system views of Teams. This is simply because they are explicitly filtered out. You can change the definition of those views, or add your own to show them if you want to. I could imagine doing this for Teams of type “Access” which are *not* system managed, in particular. It is not really weird if you think about a global organisation with thousands of records which use Access Teams for sharing – you would never find the teams you really want to manage amongst all of the access teams. 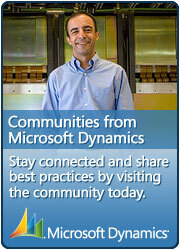 Since you should not need to directly administer access teams in the same way, you might as well hide them. IMPORTANT: Records shared with Access Teams DO write to the POA table, in order to describe the rights that have been shared with the Team for a given record (easy to prove by taking a look in SQL). So for every Opportunity that has users added to an Access Team, there is a Team record created and the Opp is shared with that Team. This could involve thousands of POA table rows, so this is not where the performance improvements come from. When you share a record with a Team, the members of the Team get the privileges explicitly defined in the share, regardless of security roles the Team may or may not have. The rights shared will only take effect if the user also has that privilege to at least User level (so you cannot share a record with someone and give them more rights than they would have if they owned it). I appreciate you detailed post, it was very interesting. One day I learn how access teams and templates work in the front end and today thanks to your comments I am learning more about how they work on the back end. I guess it makes sense in some ways they aren’t in views because they are dynamic, quick and have incomprehensible guid names but then on the other hand it would be useful because you can still use the view to manage the members. As you say there could be 1000 of access teams created which is probably why they make it so easy to manage the user access with sub grids. I guess this is part of the process of understanding new functionality and how it works. thanks again for your very informed comment, it certainly made me think a great deal about Access Teams and what I wrote. Fantastic Explianation , Thanks very much for gathering all key information on this topic.